Sh. Narula informed that consequent to the continuous spell of rains which disturbed the Yatra during the first three days and, later, on 4th and 5th of July, and caused serious damage to the Baltal-Holy Cave track, restoration work was taken up on war footing and the track conditions have been improved to enable the movement of Yatris on the Baltal-Holy Cave route. Mesh fencing and other protection works have been taken up jointly by PWD and BRO to address the problem of shooting stones at vulnerable stretches of the track. Lighting arrangements on the Baltal-Holy Cave route have been augmented to facilitate the movement of Yatris. Teams of MRTs, NDRF and SDRF have been deployed at various vulnerable and critical stretches along the track to assist any Yatri in distress. He further informed that cut-off timings have been revised to ensure effective utilization of day light hours for the movement of the Yatris. This has allowed Yatris to safely return to the Base Camps before night fall. The recently installed micro ATM at Panjtarni has further eased the cash related problems of the Yatris. On the 14th day of the ongoing pilgrimage, Yatra Convoy moved smoothly from Bhagwati Nagar Base Camp Jammu towards the Nunwan and Baltal Base Camps today, carrying 4943 Yatris. 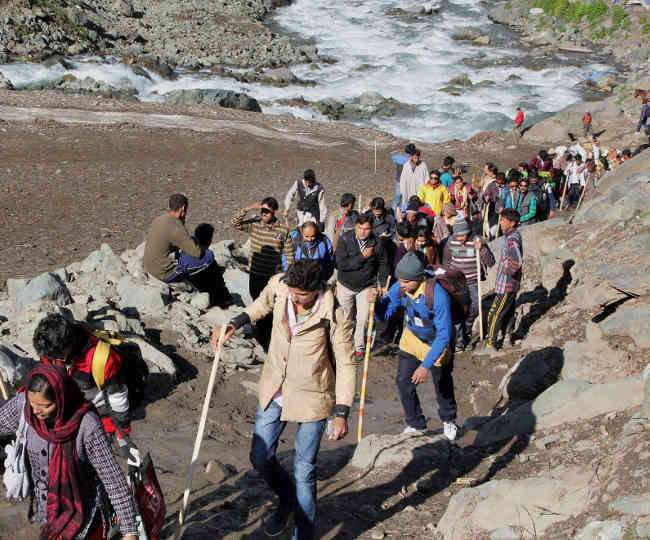 Nearly 14,000 Yatris proceeded towards the Shrine on both Pahalgam and Baltal routes. 15696 Yatris paid obeisance at the Holy Cave, taking the total to 1,33,481 Yatris who have performed darshan of the Holy Shivling. Furthermore, On-spot Registration facility is being provided to all unregistered Yatris at Jammu and Srinagar.